In the Nišava Administration District we have a registry office in order to ensure an easier, faster, simpler, and more rational realization of rights, obligations and interests of citizens and other parties and in order to relieve the work of inspection services from parties. Professional services, the registry office especially, is at the service to all citizens and other interested natural and legal persons during working hours from 07:30-15:30. -At the registry office of the District the interested party receives the full information about the submission of requests, applications and other submissions, as well as, the information about any taxes in the case when they have to be paid in accordance with the Law on Administrative Fees and other valid costs. After the registration, the received requests are forwarded to the supervising inspection services to be completed. -On the rescripts written by the inspectors it is necessary to put an instruction on the legal remedy, as well as, the name of the body and the description of the filing of the appeal for a decision or conclusion. 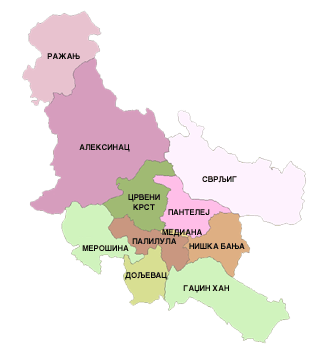 Unsatisfied parties can appeal to the second-tier body, that is, to the minister of the adequate ministry whose regional units are located in the Administrative District. Personally, to the counter of the registry office, third floor of the Business Centre Ambasador, address: Stahinjića bana 3, Niš, from 07:30-15:30 o’clock. via mail to the address: Nišavski upravni okrug (the Nišava Administration District), (indicate to which inspection department the post should be delivered) Strahinjića bana number 3, 18000 Niš.